Back to Basics: What can I use Bone Broth for? We feel thrilled that our award-winning bone broth is enjoyed by so many. But, we also know that some, especially those who might be discovering it for the first time, are curious when it comes to using it. In our Back to Basics series, we’re going to dispel any bone broth myths that are out there and tell you all you need to know – starting with the many ways you can cook with and eat it. 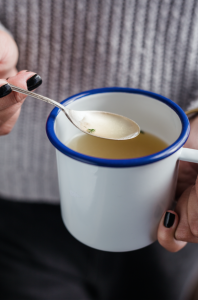 Bone broth can be used in many ways, from being a substitute for stock (bone broth contains a lot more nutrients than your average stock and plenty of delicious gelatin), eaten as a soup or used as a tasty addition to so many different recipes. Drink it straight up. Yep, you can heat it, drink up and go! Pour it into a thermos and take it on your commute. Perfect during those chilly mornings or a comforting pick-me-up at the end of the day. Use it as an alternative to stock. 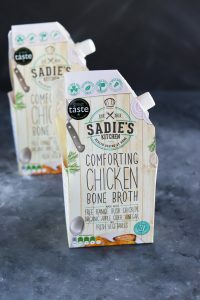 Bone broth is different from standard stock; similar but different! A well-made bone broth is left to slowly simmer for hours, using specific ingredients to break down and extract all of the goodness from the bones. What you are left with at the end is much thicker than a typical stock, thanks to all of that delicious gelatin. Use it to make grains. When cooking your favourite ancient grain, such as quinoa or farro, you can use bone broth instead of water. Freeze for later use. You can buy in bulk, freeze and use it whenever you fancy! Pour bone broth into ice cube trays and freeze. You’ll have individually portioned broth at the ready. Make soup. This is a tried-and-true way to use bone broth. Or how about a base for any soup or stew? We have loads of different soup recipes HERE to get you started if you’re stuck for ideas.